Save the World for the corporations! In "When pigs fly", you, the lone mogul pig from Wall Street, compete with other self-made pigs. In your quest to get to the promised lands of tax-haven tropical islands, you have to stay away from the evil IRS, who will stop at nothing when it comes to taking your hard earned money. Not even if it means chasing you down in jet fighters. So be brave, greedy and swine-like! Pick up coins on the way, grow big and fat, and use your weight to force the tiny pigs out of the way. But be smart, the richer and bigger you become, the more likely it is that the IRS will get you. It's a cruel world out there, it's the survival of the fattest. 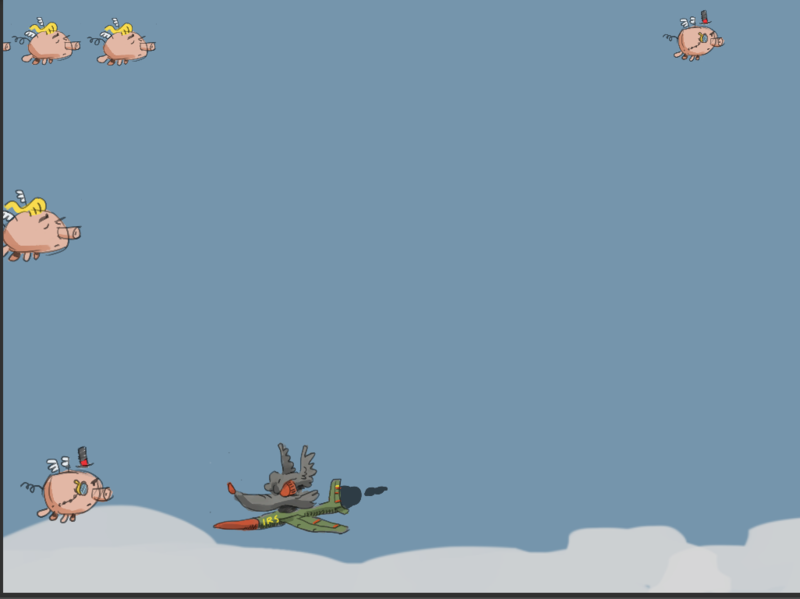 Because as you all know, you will see a game where you try to save the world of finance from the “evil” IRS, when pigs fly! player one uses wasd and player two uses arrow keys.